*We accept no responsibility for putting under-rated car tires on our porky SUV. As the recent Ford Explorer rollovers have proven, all rollovers due to the obesity and top-heaviness of SUVs are the sole responsibility of the tire manufacturer. 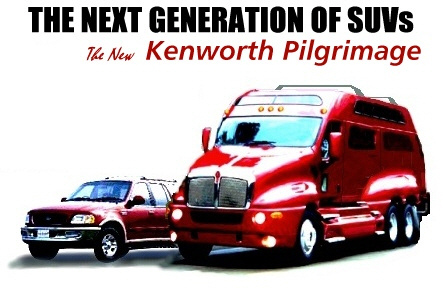 We buy Kenworth semi chassis and build SUVs on them. Shown is the Dominator model, which includes the eight rear wheels for handling those trips to Sam's Club. Fits under MOST bridge underpasses. The first SUV to be rated in Gallons per Mile by the EPA. Meet interesting people while waiting in line at Interstate Weigh Stations. When kids do the arm signal, you get to honk that really cool air horn! Get a big rush when your Firestone tires blow out. Lots of road-hugging weight for occupant protection, the ULTIMATE in safety. Can seat 20. Go ahead, take the WHOLE soccer team. Can tow your camper, yacht, a trailer-load of frozen pizzas, or even your house! Yours for under $200,000 ($100,000 for truck chassis + $100,000 standard SUV markup). Traildodger - two wheel drive model, our best seller. Eliminator - our Sport model - includes a 900hp quad-turbo 12-cylinder Cummins Diesel engine, previously only available in merchant barges. Built to resemble those oh-so-groovy custom vans of the 70's. 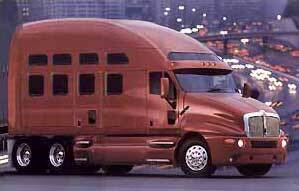 Dominator - Who else can boast ten-wheel-drive and eight tons of road-hugging, occupant-protecting mass? The Grand Dominator (pictured below) - The ultimate SUV- Adds extra high roof/cathedral ceilings, power expandable sides, full lavatory, four cell-phones, white leather interior with lambswool carpets, TV/VCR/Nintendo 64, Sony DSS satellite, beer cooler (go ahead, drive drunk, nothing's gonna kill you in this thing! ), and a permanent cellular link to the internet. Salvaged from the now defunct poseur.4x4.org. This was a lot funnier before International released the CXT in 2004.